Matudnila.com - A Cebu Events Blog: EDGE, NEO's new Ultra-Slim Laptop launched in Cebu! Home Technology EDGE, NEO's new Ultra-Slim Laptop launched in Cebu! EDGE, NEO's new Ultra-Slim Laptop launched in Cebu! Who would ever think a few years ago that notebooks, laptops or “netbooks”-those computers so small, they fit into designer bags, would be as trendy, sought-after and diverse as mobile phones? The IT generation’s constant need for up-to-date information, social networking and alternative means of communication has given rise to a wide array of ready-to-go, work-anywhere personal computers in a multitude shapes, sizes, specs and even colors. NEO, one of the country’s leading manufacturers and distributors of excellent and dependable consumer portables, introduces its latest line of mobile computers, aptly named the EDGE - a new concept that will perfectly fit the new fast-paced and exciting digital lifestyle, great for work and leisure, or both. First impressions will surely last as a Neo EDGE Z3240 maybe one of the smartest and hippest looking laptop you will ever see. It’s a wonder how this carefully engineered work of art packs so many great features in such a compact frame that redefines the term “ultra-thin”. Its compact build may give you the impression that this laptop is not a serious computing machine. We beg to differ. The Edge Z3240 is actually a travelling executive’s perfect companion, ideal for both business and multimedia applications even on long trips because it has a longer battery life than standard-voltage notebooks. And powered by Intel - the industry leader in processors, this slim beauty carries a big stick. The 120 GB hard drive is sufficient enough for downloaded movies, music, pictures and all those work-related dragging stuff such as spreadsheets and documents. For serious business presentations, the Edge Z3240 connects easily with any compatible projector, LCD monitor or HDTV via standard VGA and HDMI port, the latter being a new, up-and-coming standard for high definition output from your laptop. Just hook it up and you’re good to go. Wireless connection is also a cinch with Bluetooth, Wi-Fi and the built-in 3G/HSDPA slot where you can plug-in any local 3G SIM card and you’re off to the internet races. Surf the web at 3G speeds in school, at home or at your favorite coffee shops and hang-outs. 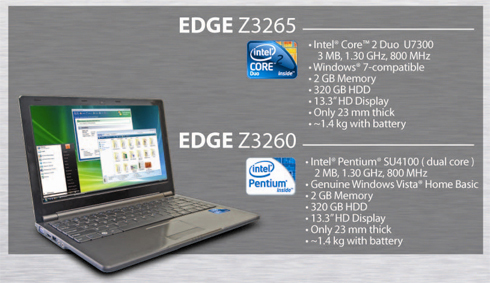 Cliché as it may be, the EDGE Z3240 is definitely not your ordinary laptop. It’s also great for students who need to be online all the time. Doing school reports is a cinch and the Edge Z3240 can even take on some serious stuff like video presentations for school projects. And with its cool and hip design, the EDGE Z3240 will be a sure-fire hit among your classmates and friends. Tipping the scales at less than 1.5 kilograms and thinner than 22mm throughout its sleek silver metal finish and lightweight construction, the EDGE Z3240 beautifully traverses the fine line of efficient performance and silky ultra-portability – joy to experience and behold. Pre-installed with the latest Microsoft Windows operating systems such as Vista or the up and coming Windows 7, every Neo EDGE Z3240 is up and running out of the box. Simple and user-friendly, it also offers a comfortable and familiar environment for computer users of any level. And with its consumer-friendly packages, Neo EDGE successfully disproves the long-running myth that laptops need to be expensive to be powerful and efficient. Not anymore. As a name trusted in providing quality laptops at affordable prices, NEO constantly ups the ante by partnering with industry leaders such as Intel and Microsoft to create new consumer products that enhances people’s computing experiences. Neo EDGE redefines “cutting-edge mobility and cutting-edge performance” with its stylish design, powerful performance and lightweight portability. That’s more power and mobility for the fast-paced digital generation homes, schools and businesses of today. 3 comments: on "EDGE, NEO's new Ultra-Slim Laptop launched in Cebu!" so this can challenge mac air right? Hi Darren, their laptops are definetely crafted well, their research is evident in the looks of their products. @ Dong, Im not really sure but I guess with the specs it would do. Though Mac Air taste different and unique.